CLARESSA SHIELDS: "I'VE BEATEN THE BEST AND WILL CONTINUE TO DO SO"
Presented by Tom Loeffler’s 360 Boxing Promotions, advance tickets for UNDISPUTED priced at $25, $50, $100 and $150 can be purchased through AXS HERE .The StubHub Center is located at 18400 Avalon Boulevard, Carson, CA 90746. For more information please visit their website at www.StubHubCenter.com. UNDISPUTED is headlined by the Consensus #1 Ranked Women’s Pound-for-Pound Fighter and Undisputed Women’s Welterweight World Champion ‘The First Lady’ Cecilia Braekhus (34-0, 9 KOs), defending her titles (WBC, WBA, WBO, IBF, IBO) against two-time world title challenger, Aleksandra Magdziak-Lopes, (18-4-3, 1 KO), a native of Gilwice, Poland, now based in Marshfield, MA in the televised ten-round main event. Magdziak-Lopes also holds a victory over Braekhus’ recent opponent Kali Reis. The tripleheader will be televised live on HBO Boxing After Dark beginning at 10:20 p.m. ET/PT. 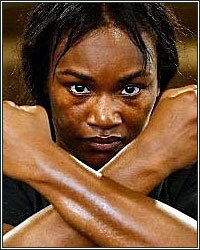 Opening the telecast, two-time United States Olympic Gold Medalist and WBC/IBF/WBA Women’s Middleweight World Champion Claressa Shields, (7-0, 2 KOs), of Flint, MI faces WBO Women’s Super-Middleweight World Champion Femke Hermans, (9-1, 3 KOs), of Londerzeel, Belgium in a ten-round middleweight world title clash.